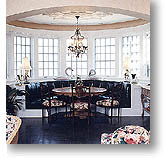 P & T Millwork, manufacturers of custom doors and casings, representatives of Marvin Windows and major door manufacturers. We chose to represent Marvin windows for their uncompromising quality and the true custom nature of their product. Every Marvin window is made to order specifically for your project and backed by a comprehensive ten-year warranty. We also represent a variety of door manufacturers. Whether solid wood or MDF, standard or custom made, we can supply your doors. If we can't find them, we will make them! If you need custom casings for your specialy shaped windows or doors, we will make them also. One of our window and door professionals will be happy to help with your construction project.